If you read my dress post, then you know that I have a lot of formal fabric scraps around the house. I hate throwing them away, so I make headbands for my daughters and for my Etsy shop. I love Silk Dupioni – it is just so rich-looking to me. 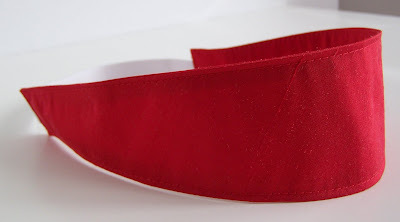 This red fabric headband would make a great accessory for holiday attire. It will fit tweens to adults, so if you have one on your list or would like this for yourself then leave a comment. Be sure to give me an email if you do not have one listed in your account. These fabric headbands are very comfortable. Unfortunately, because I cannot pull off the Jacki O look and because I have some grey hair, I only pull my hair back in a headband when I’m cleaning the house! I will leave the contest open until the end of Friday. I will select a winner and mail it on Saturday. This is fantastic as I don’t want to wear my fringe down all the time! red is a good color for the holidays . thanks for the giveaway too . Love it! I especially love the width — I think it would work well with my curly hair. Thank you! The red is very pretty for the holidays! Thanks for the chance! and to answer you yes… as a musician, Christmas is one of my least favorite times of the year.. there is just too much to prepare for and the whole meaning of the season becomes lost…. my deepest regret. Having said that… after tmrw I can relax a bit and begin my advent! albeit only 9 days long! Beautiful! It would match my Christmas dress beautifully. So pretty! It would look lovely on my little girl’s sweet blonde head. Really I was just dropping by with comment love from PEAR, but who can resist a great giveaway?!? I’m just working on the best way to dye off those stray gray hairs :oP So I’ll wear the headband out anyway! This headband would really help me control my puffy hair. 🙂 Love the color and design.. thanks for giving us a chance to win it! This is so sweet. Can see myself wearing this. My friend would love it too! Great headband is wonderful colors! I actually love all your headbands! Come over to my blog to read MAIDEN JANE’S feature! Wow what a great idea I hadnt even thought of doing that with my spare sewings. Very cute! Love the plaid headbands! Thanks for the opportunity!! please count me in! i’d love to win a headband! This headband makes a dramatic statement in Red.. and is perfect especially for the holidays..